Partly cloudy this evening, then becoming foggy and damp after midnight. Low near 50F. Winds light and variable.. Partly cloudy this evening, then becoming foggy and damp after midnight. Low near 50F. Winds light and variable. 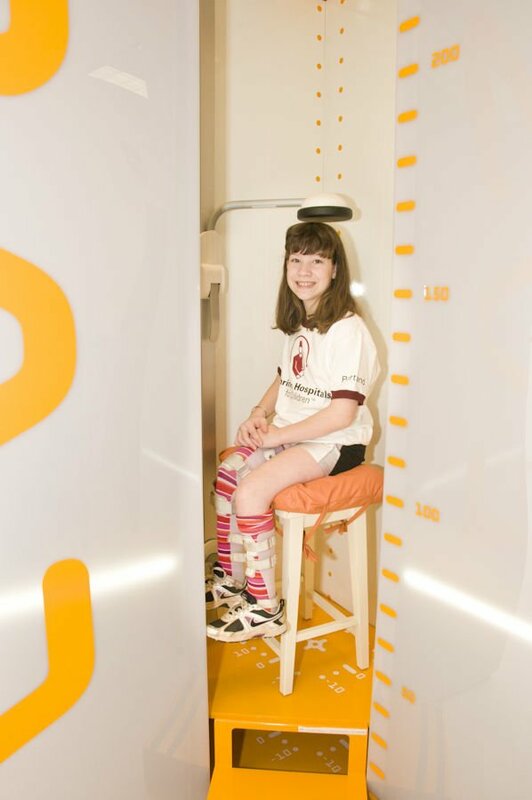 A patient at Shriners Hospital for Children awaits an X-ray in the EOS unit. This system allows for low-dose radiation exams to be taken from the front and side at the same time. The system greatly reduces overall radiation exposure for young patients who need multiple X-rays over an extended period of time. Participants in the tour of the Shriners Hospital for Children in Portland pose for a photo at the outdoor playground for children and their families. Tour organizer Buzz Mitchell is in the front row at far left and former Shriners hospital patient Jacob Farmen is in the front row at center. To Farmen's left is racing announcer Cory Penfold. It was a happy homecoming for Jacob Farmen when he visited the Shriners Hospital for Children in Portland. Farmen, 32, was part of the group as the Al Kader Linn County Shriners Club toured the hospital on Friday, April 12. This was the third annual tour for the group, which brings Shriners and members of Oregon’s racing community together to visit the non-profit hospital. Farmen was born with multiple leg deformities – his lower right leg at birth was rotated fully backward – and he also suffered from scoliosis. He underwent 21 surgeries at the Shriners Hospital for Children to correct his leg and back issues and had his last appointment there on his 21st birthday. Farmen grew up in a racing family and he developed his own love of racing. He competed as a driver up until his senior year of high school. “Because racing is so physically demanding it was too hard on my body. I put it to bed and became a crew chief,” Farmen said. He worked as a crew chief for his uncle, well-known kage kart and sprint car driver Patrick Dills. Farmen is a strong believer in the Shriners hospital and is working to become a Shriner himself. He is already a member of the Masons and is in the process of becoming a master mason, a requirement which must be met before becoming a Shriner. The annual tours are the brainchild of Cory Penfold, the former announcer at Willamette Speedway, and Buzz Mitchell, a member of the Al Kader Shrine. They work together to raise funds for the hospital by teaming up with tracks and drivers to hold special events. Last year, Al Kader was honored as the Shrine of the year in Oregon for its fundraising efforts. Mitchell said the group donated $18,500 in cash and also contributed three power chairs valued at a total of $17,000. “Last year was an exceptional year,” Mitchell said. The tour is a way of connecting drivers and their families with the hospital. Joey Tanner, the 2018 late model champion at Willamette Speedway, took part in the tour for the third time. Mitchell once again has a slate of fundraisers scheduled for this summer. On May 25-26, the Shriners will be selling 50-50 tickets for both nights of the Marvin Smith Memorial Grove Classic at the Cottage Grove Speedway. The Shriners will also be at the Cottage Grove Speedway on June 22 selling 50-50 tickets. Mitchell will present winners with Shriners race trophies at this event. On July 13, the Shriners will host their annual race night at Willamette Speedway. They will once again sell 50-50 tickets and will also be seeking sponsorships. Sponsors will be recognized on the banner at the speedway. Mitchell is thankful for the assistance of the racing community in these fundraising efforts and he hopes the partnership will continue to thrive. Moved to the campus of the Oregon Health Sciences University in 1983. There are 29 beds for in-patient care and outpatient services are also available. Provides care children up to 18 years of age. Offers a wide range of services with specialties in orthopaedics, burn care, spinal cord injuries, cleft lip and cleft palate. Insurance is accepted but families are not billed for any amounts not covered by insurance. Buzz Mitchell is passionate about the Shriners Hospital for Children and his enthusiasm has a way of infecting others.